August Laceless KAL – Choosing Your Colors! You are here: Home / August Laceless KAL – Choosing Your Colors! 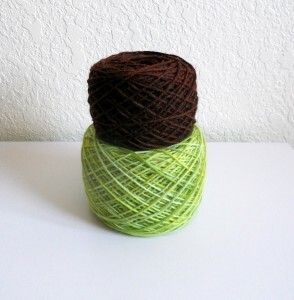 With a little more than 2 weeks til we start the knit a long, I figured I should probably do a little post about colors. The yarn I’m using showed up today! I went with Knit Picks Stroll in Springtime and Merlot Heather. 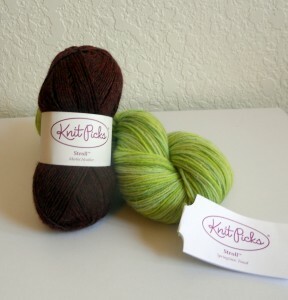 Springtime is going to be my Main Color, and Merlot Heather is going to be my Contrasting Color. Since I’m sure everyone joining in has different color preferences, I’m going to show a swatch of my chosen colors. If you swatch in a similar manner using stashed yarns, or visualize them this way as you shop, you should have no trouble picking colors for this project. First I’m going to wind my yarn on my shiny new ball winder. And then I’m going to knit a swatch. You’ll see I’ve started off with a few garter stripes before trying a few spaced out stockinette stripes. I’d recommend choosing a solid or semi solid as the Main Color. There are short rows in the pattern which might disturb self-striping yarns or create weird pooling effects in a variegated. The Contrasting Color is the place to get creative and have fun. There are no short rows or other weird things to disrupt the color, and choosing a variegated or self striping yarn that complements the main color could be very fun. 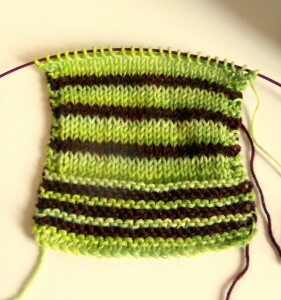 I’ve decided I like the colors together, so I’ll use this square to check my gauge. I have 22 sts to 4 inches. With blocking, I should be just fine! Stitch gauge is more important than row gauge in this shawl, and there was enough yarn left over in my first sample to allow for some wiggle room. The important thing is to make sure your stitch gauge is close, and that you like the feel of the blocked fabric. Happy Swatching, Everyone! I’ve added the pattern to Ravelry so that you may queue it or link to it in the forums. I’d love to hear what yarns you’re going to use! Hi, Manda! I chose my yarn today and caked it up, so I’m ready to go! I was definitely thinking fall colors! I went with KP yarn also. Check it out – http://www.ravelry.com/projects/MisKnitz/laceless Looking forward to getting started!! Your shawl is very very nice and I would be glad, if you can send clue 1 to me. Could you send me the first two clues? Somehow I missed this Kal. Thanks!